"What's happened to our leaders and to our leadership?" 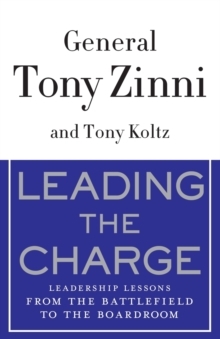 Based on General Zinni's leadership experiences from the battlefield to the boardroom, Leading the Charge shows a new way through the significant leadership challenges of the 21st century. The times are changing at an ever-increasing velocity. Old systems, organizations, and ways of operating no longer work in our dynamic, complex and increasingly unstable new environment. Out of this chaos and confusion, a new and different leader must emerge. Old systems and methods will no longer work. Leading the Charge is a visionary leadership book that examines the trends that have reshaped our world and the ways in which visionary leaders and organizations can effectively respond. Tomorrow's successful leaders - in all fields, including the military, academia, politics, and business - must know how to create, operate, and thrive in very fluid, flattened, and integrated structures that are remarkably different from the traditional organizations we are used to seeing. They will have to manage rapidly changing technology and flows of information, and create faster and more far-reaching spans of control. Leading the Charge shows the way, and is an incisive and compelling guide to the new world of leadership, one that will prove indispensable for years to come. Organized around "Leading a New World," a revolutionary leadership course General Zinni developed and taught at the Terry Sanford Institute of Public Policy at Duke University, Leading the Charge makes a convincing case that leaders must ...- change with the times to be relevant. - be ready for crisis mode at any given time. - have a moral compass and the ability to steer the company in the right direction. - be forward thinking, not reactive, to provide innovation and creativity. - develop great leaders.